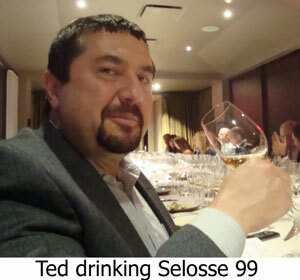 On May 24th, 2013, The Rare Wine Company held a Jacques Selosse tasting at The Nomad in New York City. 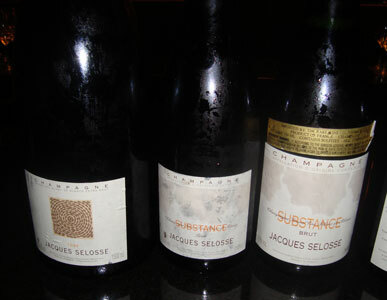 It was a chance to taste all of Selosse's rare Lieux-Dits as well as multiple disgorgements of the Initial, Substance, and the 1999 VIntage from magnum. Peter Liem was there speaking about the wines and he certainly knows as much as anyone except perhaps Alselme Selosse himself on the wines. I attended with The Spaniard, a fan of fine bubblies (and shoes apparently). We began with the 1996 Huet le Mont Sec as an apertif. Nice and I took no notes. The Initial: The Initial is always made from 3 successive vintages and from Chardonnay from the bottom of the slopes of Avize, Oger, and Le Mesnil, and it's usually aged on its lees for 5 years. Based on my experience and notes it does significantly improve with time in the bottle! The nose has apple, a little apple cider, mint, slightly oxidative, and very pure. A little red apple. The palate is "Wow!" Minty like a Meursault Les Genevrieres . This is big and intense with a long future. A touch of vanilla aftertaste with air. The nose is bigger and rounder the the more recent disgorgement above. A slightly minty/spicy ethereal quality. Such a spacious and expansive nose! After 30 minutes, the notes become more Burgundian. Almost fireworks on the palate: Minerals, spicy apple, incredibly long! This is actually labeled "Tradition" which is the old name of the Initial. The nose has deep apple, lovely high-tones appley spicyness, coffee. Very slightly mild & very smooth. The palate is the smoothest and most sophisticated of this flight, with deep intense apple with spicy overtones yet very smooth! 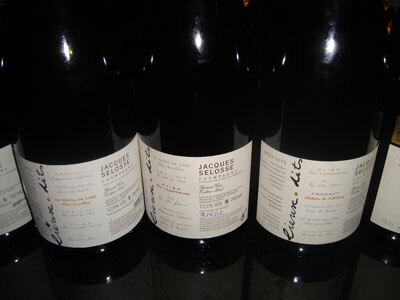 In the fall of 2010, Alselme Selosse announced he'd be releasing six single vineyard wines or Lieux-Dits, 3 Chardonnay and 3 Pinot Noir (although one has a few Chardonnay vines as well). Obviously produced in miniscule quantities, I was very happy to get a chance to taste them all! His first Lieux-Dit predates these wines and was called Contraste (now called La Cote Faron reflecting its single vineyard origin , tasting note below). He started it when he was offered a plot of Pinot Noir in Ay. He made a Solera, and at first all this wine was bought entirely by Italians. Although the announcement of these wine was made in 2010, he had selected these 6 superb vineyards in 2003 for these wines. These are all quite young. Every one is rated an honest A! These are 03 base wines with 04 and 05. Very focused and pure wines. I didn't like them as much as the Pinot Noir based Lieux-Dits, but no question they are phenomenal and I love every one of them! The Le Chemin de Chalons and Les Chanterelles are physically close to each other, despite being in Cramant and Avize respectively, and are somewhat similar. The Les Carelles is completely different and may be my favorite. Nose - freshly cut green apple, a little chalk, perhaps a touch of Spanish olive. Palate - spicy, fuzzy, festive, very focused. Quite a bit of minerality and a touch of lemon. Nose - hints of baloney (although I may be the only one that got these) and mint, some chalk, touch of honey. Incredibly fresh. Palate - Nicely fuzzy feeling, maybe eucalyptus? and some mint. Very long and creamy with air. Les Carelles - Le Mesnil, a south facing slopes with old vines. Nose - Spicy and minty yet laid back and relaxed with a warm chalkiness. Palate - Light and ethereal witha sharp fresh cut appleness that fits well. Rolling mintiness. Selosse has traditionally had largely Chardonnay vines, so this represents a change. These were my favorites, as if one can chose favorites at a tasting like this. La Cote Faron - Ay, a very steep south facing slope, too steep for tractors so everything must be done by hand. From a Solera dating back to 1994. Nose - Sweet, berries, chalk, apple as it breathed. Palate - big and spicy yet very smooth. Red fruits under the spiciness. A sense of non citrus orange fuits. This is the mildest and sweetest of the Pinot Noir Lieux-Dits although neither mild nor sweet! Le Bout du Clos - Ambonnay, a sort of south facing and not steep vineyard. There are a very few Chardonnay vines in this vineyard which are also in the wine. A 2004 based Solera with 2005 added. Nose - Minerals, some mint, flan. Vanilla Burgundian tones. Palate - Strong and juicy, spicy, red fruits. I absolutely love this! Sous Le Mont - Mareuil sur Ay, an east facing vineyard near and behind the famed Clos des Goisses. There is a lot of magnesium in this terroir which Selosse says adds some bitterness. A 2004 based Solera with 2005 added, like Le Bout du Clos. Nose - cantaloupe, cherries, lilacs, purple flowers. Palate - Big, spicy, a hair of (lovely) bitterness, purple fruits. The Substance is the only Champagne that is a true Solera, started in 1986. All vintages, good and bad, are added, and this wine spends about 6 years on its lees. Substance clearly gets better with time in the bottle based on the below tasting. Palate - my notes only read "Intense!" - and it is! Much more expressive than the 2011 disgorgement. Nose - expansive, a little vanilla, high-toned pear, sandstone, some spice. And now for something entirely different based on the characteristics of the 99 vintage. This wine is very ripe and high alcohol, in the 14% range. Chardonnay from Avize, and like the Substance, always from two parcels, one chalk based (Les Chantereines) and one clay based (Le Mont de Cramant). Nose - like a sweet wine almost. Apricots, minerals in the background, and vanilla with pear. Palate - intense, big, fruity/spicy, minerals, and long. Definitely sweet. What can I say other than wonderful tasting? I am not likely to see these wines often if even again, with some of them made in miniscule quantities. Although I do have a couple of Selosses in my cellar . . .